Can’t stand the heat? Get out of the kitchen fast with easy no-cook meals. When temperatures soar, the last thing you want to do is sweat over a hot stove. Your solution? Make a delicious, three-course meal without ever turning on the oven! No-cook meals are perfect for sultry summer evenings when you want your kitchen to stay cool. And don’t think “no-cook” means baby carrots and bowels of cereal. As these easy menus prove, with a bit of creativity you can make an amazing dinner full of nutrients without a single pot or pan. 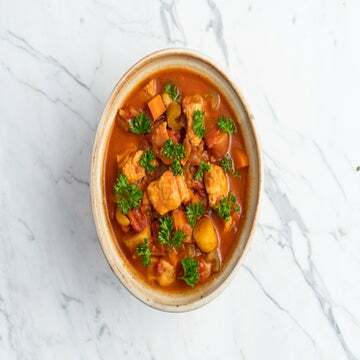 To give the stove the night off, follow these tips from Diane Henderiks, a dietitian and personal chef in New Jersey, to make your no-cook meals no sweat. Shop at the market. With summer in full swing, farmers’ markets are plush with a dizzying array of fruits and vegetables that add a bonanza of raw flavor and nutrition. Covet convenience. The grocery store is full of nutritious, semi-prepared foods that make no-cook cooking a breeze. Frozen mixed vegetables, deli turkey slices, canned fish, rotisserie chicken, smoked salmon and canned beans are great bases for a meal. Blend soup. Cold soups make for a nutritious addition to a stove-free meal. Fresh vegetables, yogurt and fruit can be transformed into chilly soups with great success by mixing ingredients in a blender. Elevate salads. To turn the humble salad into a satisfying meal, start with a base of dark greens and build from there. Get creative with ingredients like fresh chopped herbs, dried fruit, canned chickpeas, shaved Parmesan and thawed frozen shrimp. You can also try hollowing out raw tomatoes or bell peppers and filling the shells with canned crab and diced veggies. Don’t shun sandwiches. Sandwiches are a great way to go gourmet without using the stove. Make them more interesting by trying different types of whole-grain breads, crunchy vegetables, interesting proteins like turkey ham or marinated tofu and artisanal cheeses. Top with a flavorful spread; homemade pesto or olive tapenade can make any sandwich more interesting! Set aside 1/2 cup chopped tomatoes, 1/4 cup cucumber and 1/4 cup bell pepper. Combine remaining tomatoes, cucumber, and bell pepper along with onion, orange juice, vinegar, garlic, jalapeño, salt and pepper in a blender or food processor. Mix until smooth. Season with salt and pepper. Transfer soup to a large mixing bowl or pitcher and add reserved vegetables. Chill in refrigerator until cold. Process olive oil and basil in a food processor until well combined. Divide gazpacho among four serving bowls and drizzle with basil oil. 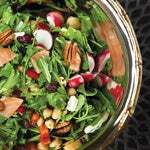 In a large bowl, toss together spinach, arugula, chickpeas, radishes, bell pepper, pecans, cherries, salmon and feta. In a small bowl, whisk together oil, vinegar and honey. Divide salad among serving plates and drizzle with dressing. Place all ingredients except for the raspberries and nibs in a blender or food processor and purée until completely smooth (about 2 minutes). Divide among 4 small bowls and chill for at least 1 hour or until thickened. If desired, garnish with raspberries and nibs before serving. Make this West Coast-inspired menu in minutes and enjoy a tasty, laid-back meal. 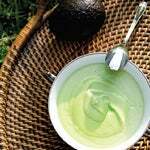 Place all the ingredients in a blender or food processor and whirl until very smooth. To make the pesto, pulse together cilantro, walnuts, Parmesan, lemon juice, garlic and salt in a food processor. With the machine still running, pour the oil in through the feed tube until the mixture turns creamy. 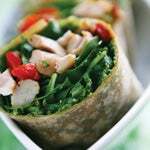 Spread each wrap with 2 tablespoons of pesto. 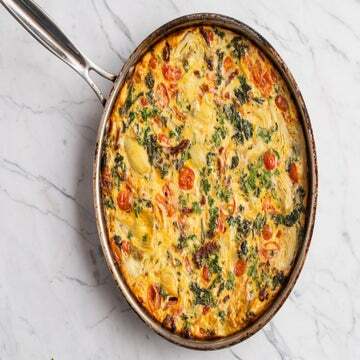 Divide chicken, roasted pepper and greens evenly between each warp. Roll wraps tightly and slice in half. Extra pesto can be served on the side or frozen for future use. Divide 1 cup of the berries between four tall glasses. Top each with half of the granola, honey and ginger, if using. 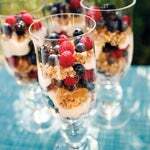 Repeat with remaining berries, granola, honey and ginger. After a tough run, your muscles need a combination of carbohydrates and protein in order to recover properly. Keep these all-natural bars in your fridge to enjoy as the perfect post-run snack. 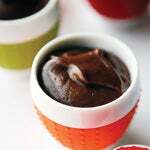 Mix all ingredients except chocolate in a bowl until all the whey has been incorporated. 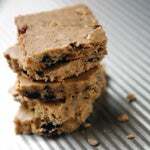 Place mixture on a lightly greased cookie sheet and roll out dough until it forms a ½-inch thick rectangle. Shave dark chocolate over the top with a cheese grater or microplane, and lightly press shavings into the dough. Place cookie sheet in the freezer for 30 minutes. Cut into 16 bars and store in the refridgerator.